“People say to me about their horses, ‘he doesn’t want to work.’ Bloody hell, horses aren’t born with a Protestant work ethic. People come up with this idea that the horse has got to work, so I ask them, how do rabbits work? How do frogs work? I don’t think ‘work’ is a word that applies to animals. What those riders call ‘work’ is just movement for a horse, so you have to make it interesting for them,” the British ethologist and horse trainer Lucy Rees told me over a cup of tea as we sat in her kitchen, surrounded by her pack of rescued hunting dogs. I visited her in July 2015 because I was writing a history of horses and wanted to understand how humans had ever persuaded skittish equines to go to war (spurs, habituation and herd instinct, it turns out). She has lived in the rocky, harsh corner of Spain known as Extremadura for decades, after a wandering life that took in a graduate degree in zoology and neuroanatomy, running an off-the-wall riding school filled with feral ponies in the Welsh mountains, ranching with cowboys in Arizona and years watching wild horse herds on the wetlands by the Orinoco. She has a knack of turning your assumptions upside down with a simple but irrevocable flip. By the time I left three days later, I was lighter by 38 years of comfortable assumptions about horses and riding, and felt like I’d finally passed through the looking glass to the place where horses lived. Jonathan Swift was wrong about the land of the Houhnhnyms – horses are not sticklers for hierarchy and order. They are anarchists. Rees has three main rules for equine psychology. The first is that horses consider personal space important – each horse has its own “force field” into which favored individuals (foals, friends, relatives) are allowed, and into which any rider intrudes. The second is cohesion, a coming together of individuals as a herd or band for greater safety like any good anarchist collective. The third is what makes our relationship with these anarchists possible: synchrony. Horses watch one another constantly. If one horse spots a threat and turns to run, the others will wheel and gallop a beat behind it. If one horse needs water, it will lead the rest to a stream. If the outlook is safe, all will graze apart from a handful of guards. 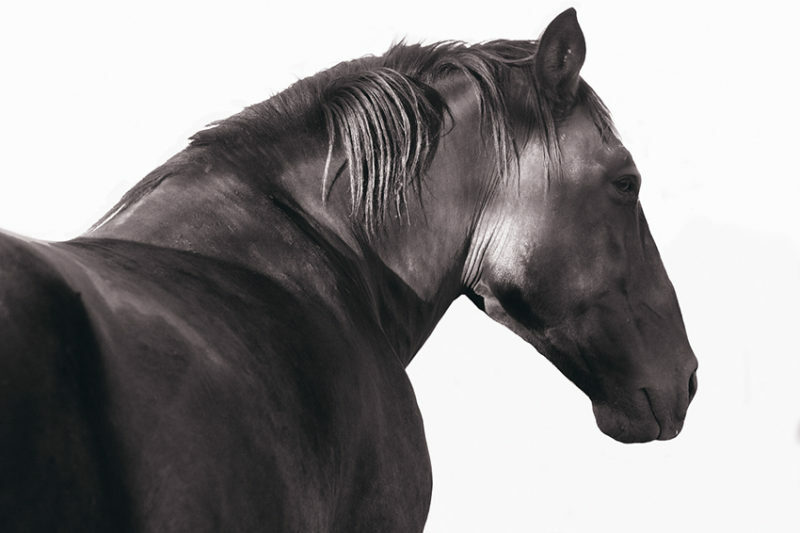 As we are also mammals and often in a horse’s immediate surroundings, they look to us for signals too – and respond. The famous early twentieth century “thinking horse,” Clever Hans, was a master of this. Bid to count to eleven by striking with his hoof, he would paw away till he saw his handler relax when the right number was reached. He fooled a vet, a philosopher and his owner before being debunked. Rees bases her own equitation on play – she waits for the young Portuguese horses she trains to freely offer dressage movements that have their origins in natural behavior, like the prancing passage (horses will use it to show off to others), or the pirouette (she introduces this by herding cows). Before I visited Rees I had been trying to learn how to ride all over again, hoping to remake myself as a classical rider with light hands and minimal movement. But I limped around the hills of Extremadura behind her with a chronic hip injury that I was only just admitting would put an end to my own passages and pirouettes. I could still trail ride on a narrow-enough horse, but the broad-sprung schoolmaster horses and deep seat required for classical dressage left me in pain. Besides, Rees’ words opened up the greater ethical dilemma that all horsepeople know runs under our day-to-day hacking and dressage and showjumping and polo games. Perhaps my hip injury got me off a moral hook – wouldn’t horses rather not be ridden after all? The previous year I’d visited the Académie du Spéctacle Equestre in the former royal stables at Versailles, where sensitive dressage riders put horses through choreographed performances of haute école under chandeliers in Louis XIV’s old manège. Then the lights dimmed and Stravinksy’s Rite of Spring played over the sound system, and five cream-coloured Lusitanos were released with nothing but a halter on them. They didn’t dance; they sank like satisfied old camels and rolled till they were filthy. Then they galloped about and farted. Equestrianism is based on crossed purposes: horses endeavour to exist harmoniously with these bipedal mammals who persistently wander into their space and push them around, while humans congratulate horses on being, as the Federation Equestre Internationale put it, “happy athletes” whom their human co-workers believe “work hard,” “want to please” and “try to win.” Horse whisperers talk about turning themselves into leaders of the herd and getting respect from stallions. Riding instructors suggest “showing him who’s boss.” Fans of draft horses insist their Percherons and Clydesdales are unhappy if they don’t get into harness. Theorists talk about equine pecking orders that they do not realize are manmade, begun when we heaped forage in piles rather than letting horses find nourishment on open grasslands. Surrender is even written into the rubric of competitive dressage: the FEI Dressage Handbook specifies that the horse should accept the bit in “soft, submissive contact.” Who are we kidding, as we preach work to an animal who cannot conceive of it and make ourselves the kings of anarchists? The answer lies in our twinned histories. The horse became extinct in the wild in the late 1960s, when the last Przewalski horse with no owner disappeared in mountains near the Mongolian–Chinese border. Every horse on this earth – the mustangs, the brumbies, the thoroughbreds, the shetlands, the Clydesdales and even the Przewalskis themselves, now restored to the steppe – exists because since the Bronze Age humans have given horses a value above simple game meat, whether for their speed, power or symbolism. We might not be kings as far as the Houhnhnyms themselves are concerned, but we have intertwined their fate with ours, and that creates a responsibility to understand how they see the world, and to examine our own motives. We can go on calling equestrianism work – horses are not ones for semantics, after all – but we need to ensure there’s something in that dressage, jumping and driving for our “happy athletes” too, and if it can’t be interesting, give them time to gallop, roll and fart at their own will.